This kit contains a one piece glass fibre hull, all decks and superstructure in 1mm printed plastic sheet, along with photographic exploded views of construction notes. 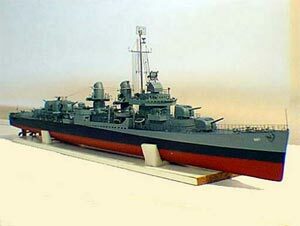 To finish off the model to a very high standard and to add the noticable "clutter" of the ship over 200 fittings cast in light alloy and light weight plastic are provided. This gives a highly detailed model. All other fittings as per the kits in our range.